سهرابی, بابک, رئیسی وانانی, ایمان, زارع میرک آباد, فائزه. (1395). طراحی سیستم توصیه گر به‌منظور بهینه‌سازی و مدیریت تسهیلات بانکی بر مبنای الگوریتم‌های خوشه‌بندی و طبقه‌بندی تسهیلات. 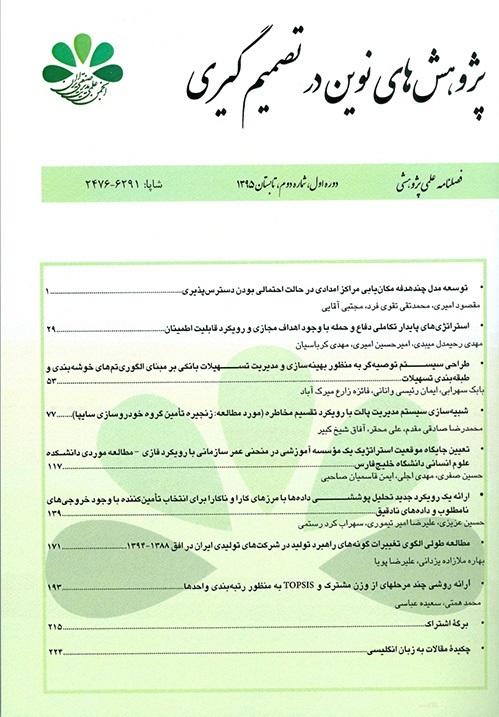 پژوهش های نوین در تصمیم گیری, 1(2), 53-76. بابک سهرابی; ایمان رئیسی وانانی; فائزه زارع میرک آباد. "طراحی سیستم توصیه گر به‌منظور بهینه‌سازی و مدیریت تسهیلات بانکی بر مبنای الگوریتم‌های خوشه‌بندی و طبقه‌بندی تسهیلات". پژوهش های نوین در تصمیم گیری, 1, 2, 1395, 53-76. سهرابی, بابک, رئیسی وانانی, ایمان, زارع میرک آباد, فائزه. (1395). 'طراحی سیستم توصیه گر به‌منظور بهینه‌سازی و مدیریت تسهیلات بانکی بر مبنای الگوریتم‌های خوشه‌بندی و طبقه‌بندی تسهیلات', پژوهش های نوین در تصمیم گیری, 1(2), pp. 53-76. سهرابی, بابک, رئیسی وانانی, ایمان, زارع میرک آباد, فائزه. طراحی سیستم توصیه گر به‌منظور بهینه‌سازی و مدیریت تسهیلات بانکی بر مبنای الگوریتم‌های خوشه‌بندی و طبقه‌بندی تسهیلات. پژوهش های نوین در تصمیم گیری, 1395; 1(2): 53-76. تسهیلات بانکی به‌عنوان یکی از پراهمیت ترین کارکرد بانک ها از اهمیت بالایی برخوردار است. اهمیت شناسایی مشتریان تسهیلاتی اگر بیشتر از مشتریانی سپرده گزار نباشد به هیچ وجه کمتر نخواهد بود. در پژوهش‌های صورت گرفته، اهمیت این مشتریان بطور نسبی کمتر موردتوجه قرار گرفته است. هدف اصلی پژوهش حاضر، کاستن از مشکلات ارائه تسهیلات مناسب به مشتریان و طراحی سیستم توصیه گر تسهیلات بانکی با استفاده از داده های قبلی مربوط به تسهیلات ثبت شده در یک بانک منتخب و بزرگ کشور می باشد. راهکار ارائه شده، با دریافت داده های تسهیلات و اطلاعات حساب مشتری، گروه های مشتریان را در طی فرآیند آموزش و اعتبارسنجی، فراگرفته و بر مبنای آن، امکان پیش بینی شرایط مشتری برای دریافت تسهیلات آتی را فراهم می نماید. به منظور طراحی راهکار توصیه گر، روش های داده کاوی مناسب به همراه رویکرد اعتبارسنجی متناسب با هر روش انتخاب گردید و سیستم نهایی با خطای اندک، جهت گیری مناسب بانک نسبت به متقاضیان دریافت تسهیلات را معین نموده است که به تصمیم گیری مدیران برای ارائه دقیق تر تسهیلات، یاری خواهد رساند. این سیستم به بانک ها کمک می کند تا با شناسایی انواع مشتریان تسهیلاتی خود، تصمیمات مرتبط با هر گروه را به منظور ایجاد حداکثر سود و کاهش هزینه های وصول مطالبات اتخاذ نمایند و رویکرد متناسبی را برای هر مشتری در پیش گیرند. در نهایت، سیستم به سرپرستان بانک نیز ارائه گردید و بازخوردهای مطلوبی برای بهبود و ارتقاء راهکار دریافت شد. Bank facilities, as one of the most important functions of banks, are very important to the survival of banks. The importance of identifying facility consumers is more than depositor customers. In previous studies, the importance of such customers has not been well considered. This study aims at designing recommender systems for predicting the customer behavior in receiving facilities, using clustering and classification algorithms. The designed system helps banks to identify types of facility demanding costumers, and to make decisions related to each customer cluster in order to make maximum profits and reduce the cost related to loans and receivables. The system accurately predicts each customer's cluster and also forecasts account balance of each customer group according to the current data set. Based on Analyses carried out on the clusters and related data sets of clients, is the recommender system is provided for to branch users. In order to design the recommender system, clustering and classification outputs were also deeply validated. The margin of error was very low and therefore, data mining outputs were verified and used to develop the final system as well as a user interface for the final utilization of recommender system which was presented and validated by the supervisors of bank. Supervisors also provided some suggestions for improving the final solution. Mehta J. S., Gawande A. (2015) "A purpose of data mining in banking sector", International Journal of Advance Research in Computer Science and Management Studies, 3(3). Ramos S., Duarte J. M., Duarte F. J., Vale Z. (2015) "A data-mining-based methodology to support MV electricity customers’ characterization", Energy and Buildings, 91": 16-25. Chen C. C., Chen A. P. (2007)"Using data mining technology to provide a recommendation service in the digital library", The Electronic Library, 25(6): 711-724. doi: doi:10.1108/02640470710837137. Afsar A., Houshdar Mahjoub R., Minaie Bidgoli B. (2014) "Customer credit clustering for presenting appropriate facilities", Management Researches in Iran, 17(4):1-24. Sajjadi K., Khatami-Firuzabadi M. A., Amiri M., Sadaghiani J. S. (2015) "A developing model for clustering and ranking bank customers", International Journal of Electronic Customer Relationship Management, 9(1): 73-86. doi: doi:10.1504/IJECRM.2015.070701. Ngai E., Hu Y., Wong Y., Chen Y., Sun X. (2011) "The application of data mining techniques in financial fraud detection: A classification framework and an academic review of literature", Decision Support Systems, 50(3): 559-569. Q. He, (1999) "A review of clustering algorithms as applied in IR", Graduate School of Library and Information Science University of Illinois, at Urbana-Champaign. Jianying M., Yongjian F., Yanguang S. (2009) A neural networks-based clustering collaborative filtering algorithm in E-commerce recommendation system, Paper presented at the Web Information Systems and Mining, WISM 2009, International Conference. Das J., Mukherjee P., Majumder S., Gupta P. (2014), "Clustering-based recommender system using principles of voting theory", Paper Presented at the Contemporary Computing and Informatics (IC3I) Conference, Amity University, Noida, India. Asosheha A., Bagherpour S.,Yahyapour N. (2008) "Extended acceptance models for recommender system adaption, Case of retail and banking service in Iran", WSEAS Transactions on Business and Economics, 5(5):189-200. Zahra S., Ghazanfar M. A., Khalid A., Azam M. A., Naeem U., Prugel-Bennett A. (2015) "Novel centroid selection approaches for KMeans-clustering based recommender systems", Information Sciences, 320, 156-189. doi: http://dx.doi.org/10.1016/j.ins.2015.03.062. Shani G., Gunawardana A. (2011) "Evaluating recommendation Systems", In F. Ricci, L. Rokach, B. Shapira, & P. B. Kantor (Eds. ), Recommender Systems Handbook (pp. 257-297): Springer, US. Guo, G., et al. (2015). "Leveraging multiviews of trust and similarity to enhance clustering-based recommender systems." Knowledge-Based Systems 74: 14-27. Hsieh N.C. (2004) An integrated data mining and behavioral scoring model for analyzing bank customers. Expert Systems with Applications, 27(4): 623-633. Anh N. D. (2015) Adaptive neuro-Fuzzy network for recommendation, International University HCMC, Vietnam. de Oña R., de Oña J. (2015) "Analysis of transit quality of service through segmentation and classification tree techniques", Transportmetrica A: Transport Science, 11(5): 365-387, doi: 10.1080/23249935.2014.1003111. Seret A.,Vanden Broucke S. K. L. M., Baesens B., Vanthienen J. (2014) "A dynamic understanding of customer behavior processes based on clustering and sequence mining", Expert Systems with Applications, 41(10), 4648-4657. doi: http://dx.doi.org/10.1016/j.eswa.2014.01.022. Yang X., Chen J., Hao P., Wang Y. J. (2015) Application of clustering for customer segmentation in private banking, Seventh International Conference on Digital Image Processing (ICDIP 2015), 96311Z (July 6, 2015); doi:10.1117/12.2197182. Islam M., Habib M. (2015) A data mining approach to predict prospective business sectors for lending in Retail banking using decision tree, arXiv preprint arXiv:1504.02018.